Smart Solar Aquanura Solar Birdbath Bubbler | Fountain City Art Ctr. Go from simple to solar in mere seconds, thanks to the Smart Solar Aquanura Solar Birdbath Bubbler. 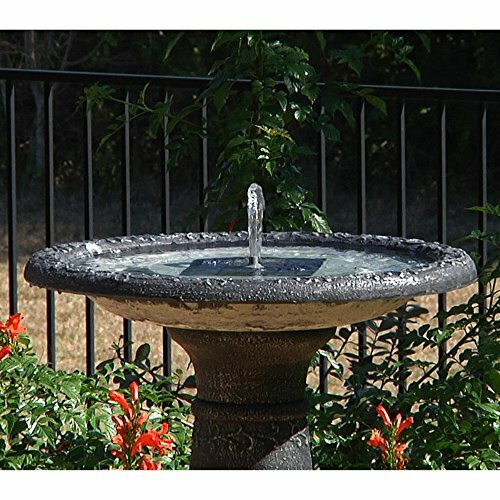 The Aquanura solar insert, made with weather-resistant plastic in a gray finish, converts your birdbath into a solar fountain. Simply place it in the bowl -- the one-step installation means more time for you to kick back and enjoy the sun,the breeze, and the bantering birds nearby. Driven by a strong belief in the environmental benefits of solar power, and the realization that consumers are becoming increasingly environmentally aware with an interest in buying solar-powered products, Smart Solar was created in 2003. Based near Oxford in the U.K., Smart Solar has offices in the U.S. and Germany, and a manufacturing facility in Thailand. Smart Solar offers products including solar pumps, water features, lights, ventilators, chargers, and specialty garden items. With an eye for fulfilling future consumer needs, and a heart for preserving the environment, Smart Solar is devoted to developing innovative, high-quality, and dependable solar-powered products. Durably built from ABS plastic. Neutral grey finish. Converts traditional birdbath into solar fountain. Direct sunlight operation. Includes spray and bubbler fountainheads. Dimensions: 9 diam. x 2H in..
View More In Backyard Birding & Wildlife. If you have any questions about this product by Smart Solar, contact us by completing and submitting the form below. If you are looking for a specif part number, please include it with your message.